As part of my Food/Work project, I found myself exploring the halls of a couple commercial kitchens around Brooklyn. This month, many of the photos from these excursions have made it into a feature in the pages of Edible Brooklyn. The article, written by Amy Cortese, discusses how the rise of small batch, artisanal foods has created a new niche market for the specialized cooking space required to produce all those cupcakes, cookies, granola and saltwater taffy. After the jump, check out some photos from the kitchens at Hana Pastries in Sunset Park. The Salty Road’s taffy pulling machine is hypnotic to look at. It’s also a lot heavier than it looks. 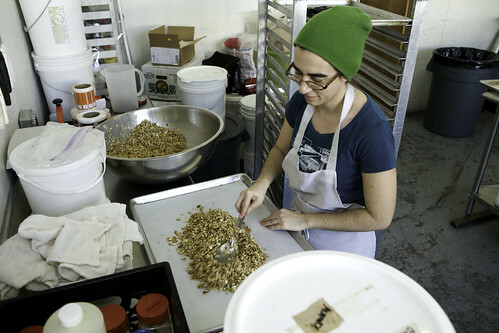 Alex from Granola Lab readies a new batch for the oven. 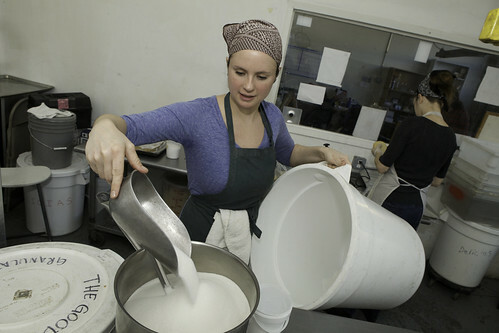 Anna of The Good Batch begins the caramel or ‘stroop’ for her Dutch-style stroopwafels. 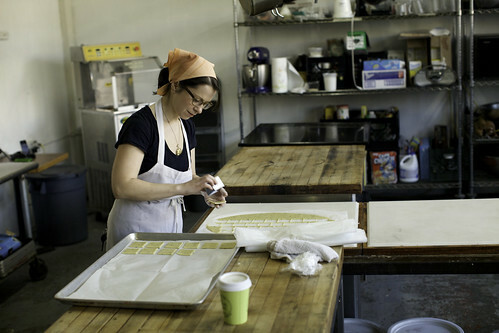 Alison from Butter + Love cuts out squares of dough for her butter cookies. See the Summer 2012 issue of Edible Brooklyn for the story and more photos.